1. Spend More Time In Nature. Humans were not made to be cooped up inside all day. Spending time in nature makes you happier, it boosts your immune system, and it even makes you more creative. Do good for others in the upcoming year. Volunteerism is one of the most selfless actions that we can take to assist others in need and build the community in which we live. After all, you won’t just be benefiting those you help; you’ll also be benefiting yourself. Volunteering can give you a sense of purpose, make your life more meaningful, increase your self-esteem, and make you happier. 3. Spend Less Time Checking Your Phone. Spending too much time on your phone is bad for your focus and mental health. Start to build better digital habits and connect with the world around you. Too much screen time is bad for our health. Set the resolution to learn something new in order to have a better understanding of the world and how it works. Fortunately, the internet makes it incredibly easy to learn new things. Dedicate your spare time in the pursuit of learning! 5. Pick Up a Hobby. Hobbies can lower your stress levels, boost your brain power, improve your ability to focus, and more. 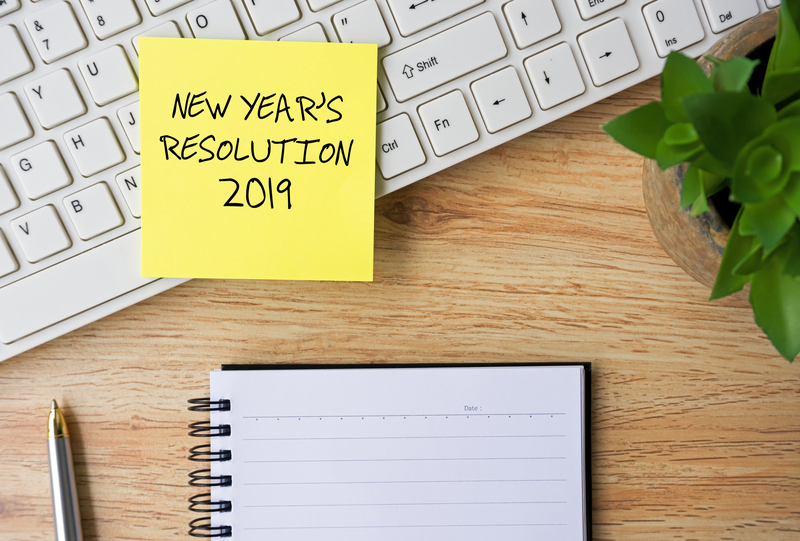 Make 2019 the year you stop thinking about starting a business and you start taking action –it’s OK if it’s a small business on the side. The first step to take is to write a business plan. Once you get your ideas down on paper, you’ll be that much more motivated to turn those ideas into reality. Everyone can benefit from physical activity. Adding exercise to your routine can positively affect your life. It reduces your risk of heart disease, high blood pressure, osteoporosis, diabetes, and obesity while also contributing to mental well-being and depression.. There are scientific studies that show the many benefits of meditating. To name just a few, meditating helps to improve your mood, it reduces stress and lessens anxiety. 9. Enjoy the Little Things. Living life to the fullest doesn’t just mean setting big goals like going bungee jumping or learning to scuba dive. It also includes learning to enjoy the little things. That is, learning to appreciate life’s simple pleasures. Leave behind the daily hustle and get away. Plan a vacation. Visit a country you’ve always wanted to see.The world is a beautiful place! 11. Book your Doctor’s Appointments. Going to the doctor isn’t most people’s favorite activity. But it is part of staying healthy. Open your calendar app and make your appointments for the year in one sitting — not only will you get the anxiety-inducing nuisance over with, but exams will be less likely to get squeezed out as life gets bonkers. 12. Make your Home Fragrant. Certain aromas can affect mood, vanilla makes people more relaxed and joyful, while peppermint can boost energy and lavender can zap stress. 13. Sanitize your Phone Weekly. We check our phones 47 times a day on average and they carry about 10 times as much bacteria as most toilet seats! Your food choices each day affect your health — how you feel today, tomorrow, and in the future. Good nutrition is an important part of leading a healthy lifestyle. Combined with physical activity, your diet can help you to reach and maintain a healthy weight, reduce your risk of chronic diseases and promote your overall health. Feel like old friends (or family) have fallen by the wayside? It’s good for your health to reconnect with them. Creating long-term saving success means creating saving habits. Try to automatically transfer money into your savings account each month or after each paycheck. This site may contain copyrighted material, the use of which may not have been authorized by the copyright owner. Consistent with the “fair use” doctrine set forth within 17 U.S.C. §107, we are making such material available for informational and educational purposes. The material on this site is distributed without profit to those who have expressed a prior interest in receiving the included information for informational and educational purposes. If you wish to use copyrighted material from this site for purposes that may exceed “fair use”, you must obtain permission from the copyright owner.